The 3 Most Important Questions That Help Close Business. Asking customers these 3 questions, helps to frame the value offered by ExactFlat in an optimal way. We recommend you ask them at the beginning of your sales process. How many patterns do you create each month? How many hours does it take to complete one pattern? 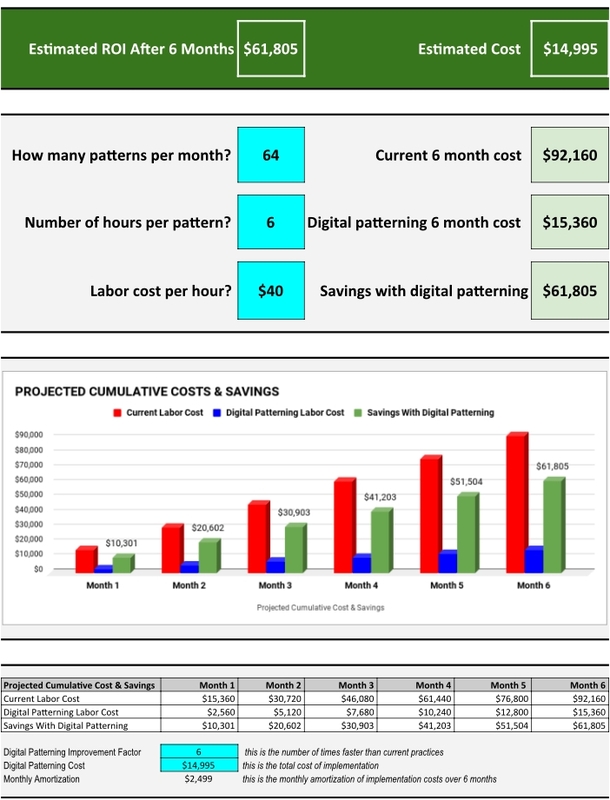 Why do you want to switch to Digital Patterning with ExactFlat? I want to improve profit. I want to improve quality. I want to expand into new product lines. I want to beat the competition. These questions help to zero in on the financial value and reasons for making a business change. The answers in question 3 relate to the core motivation for change. The answers to questions 1 and 2 help you to create an instant ROI. The blue boxes below are variables that require input. The first two boxes relate to questions 1 and 2 above. The third box can be approximated. For pattern makers in the United States, $40.00 per hour is a reasonable approximation. To download a copy of the Instant ROI template: Click here or the image below for automatic Excel download. If you have questions, or would like help working with a prospect of closing a deal, we are here to assist you. Please contact Sales@exactflat.com.